The Zoom Q2HD (current rrp in Finland: 205 €) is the company’s brand-new lightweight video recorder. Aside from full-HD video recording this new unit also offers MS-stereo. In MS-stereo two different microphone types are used to create two discrete signals, called Mid and Sides. The advantages of MS are that placement of the two mics in relation to each other isn’t as critical for overall phase coherence as in other techniques, and that you can adjust the amount of room in relation to the mid-signal during mixing. Classic MS-stereo uses a cardioid microphone for picking up the mid-signal with a bidirectional mic turned 90 degrees (= shooting sideways) to record the side-sound. You will get a stereo sound picture from these two discrete signals by ”decoding” them: The mid-mic’s signal will be sent to the mixing console and panned dead centre. The sides-mic’s signal must be split to two channels, with one being panned hard left, and the other hard right with its polarity switched. But, luckily, the Zoom Q2HD’s user won’t have to bother with the technical background, because you are only required to set the correct recording level and choose the stereo width you want from one of the five different options (mono to 150 deg) . Naturally, the Q2HD can also record with Auto Gain (three settings: Concert, Solo and Meeting), and its high-pass filter will keep low end rumbling at bay. Zoom’s Q2HD records incoming audio as linear wave-files (44,1/48/96 kHz, 16/24-bit) or using AAC-compression (64–320 kbps, 48 kHz). The unit also allows you to record audio-only files. The Q2HD is a typical Zoom video recorder in the sense that it is used with the unit in a vertical position. All inputs, outputs and controls have been placed on the recorder’s sides, while all transport and menu functions are controlled using the buttons below the crisp two-inch display. There’s even a tiny loudspeaker built in for a quick preview of the recorded material. The camera uses a 3.2-inch CMOS-sensor with five million pixels, and a fixed focus and aperture (1,32 m – ∞, F: 3,2). There are three lighting presets on offer – Auto, Concert Lighting ja Night – a well as a digital zoom (4 x). The video is processed and stored in H.264/Mpeg-4-format as MOV-files. The Zoom Q2HD is extremely user-friendly: all of its menu-icons fit onto one screen, and the device’s parameters have been kept to a minimum. The unit’s well-made graphics enhance the user-experience nicely. The Q2HD is powered by two AA-batteries (or rechargeables), giving you approximately two hours of video filming or four hours of audio recording. 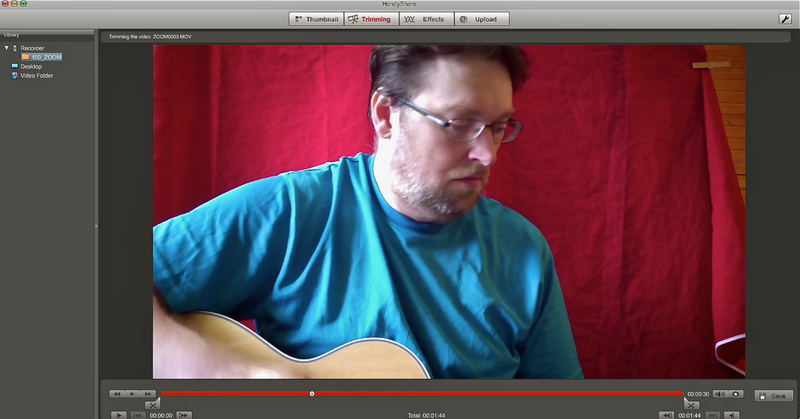 You can watch recorded video in a slightly larger format using Zoom’s Landscape-feature (see picture above). Zoom’s Q2HD also lets you perform the most basic of video editing inside the recorder itself , offering Divide- and Trim-operations. Zoom also supply their basic Handy Share software on the mini-SD-card that comes with the recorder. The software works on both Windows- (XP 32-bit or better) and Mac-run computers (Mac OSX 10.4.6 or better). …as well as audio processing using reverb, compression and normalisation. 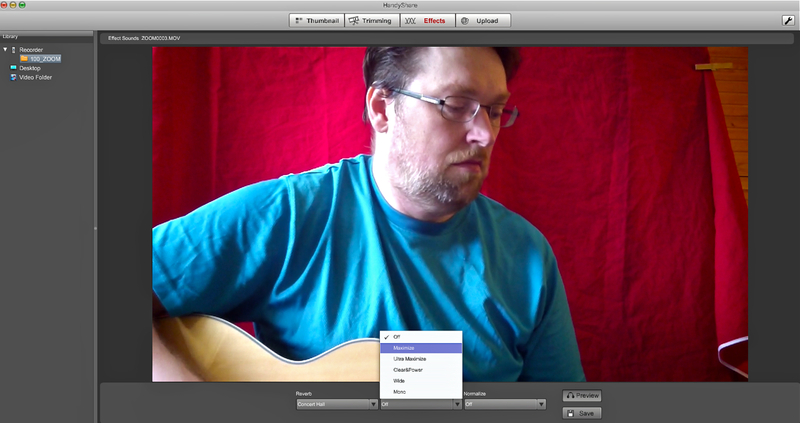 The audio effects can be previewed before rendering them to the video-file. Zoom’s Handy Share is quite OK for starters, even though many free video editing programmes, like Windows’ Movie Maker or Apple’s iMovie, will offer a lot more features and larger scope for adjustment. 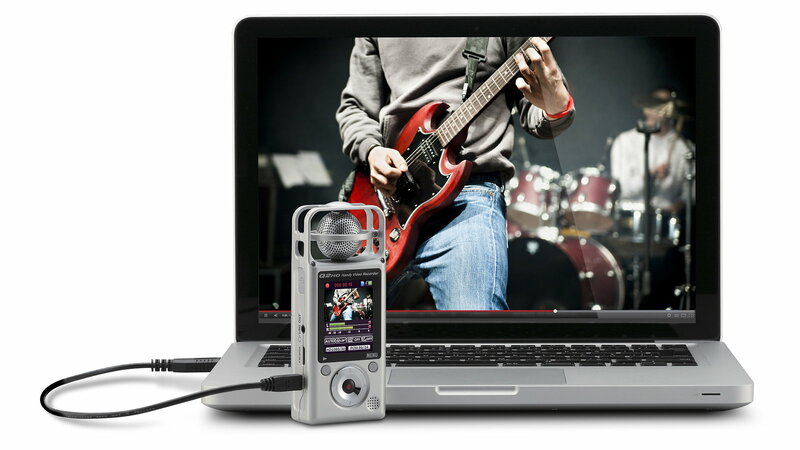 The Zoom Q2HD can also be used as a stereophonic usb-microphone, or as a webcam for chatting or live-streaming (for example via UStream). In streaming mode Zoom’s handy delay-parameter allows you to compensate for audio-video-offsets (bad synchronisation). In my opinion the Zoom Q2HD is a nice little tool for making You Tube -videos. Although the video quality of some digital still cameras is even better than that of the Zoom, the Q2HD’s far superior audio will swing many buying decisions. The Zoom Q2HD’s clean and clear audio will enable you to make full-HD net videos you can listen to, as well as watch. Hi, I live in Sardinia (Italy) and got as a present one ZoomQ2HD (here the price is about 190 euros). I am a classical guitarist, and would record both video and audio of me playing (trying to play…). But I noticed that when settings are for high quality video and high quality sound together, the result is a video slower than the audio (I play the recordings on my PC using VLC). Is there a problem with incompatible settings? Do you know how to set the Q2HD to record a classical guitar player in a room with no other persons nor other sounds? Every suggestion welcome! Thank you for your advice. Does you video actually play ”slower” than the audio (meaning: at a completely different speed), or do you mean that your audio and video are out of synchronisation (both are the same speed, but the video is always ”behind”)? Anyhow, the Zoom Q2HD has been designed to work without hiccups at all of its given quality settings, so what you describe is certainly not normal. Do you have synch problems also when watching the recording on the Q2HD itself, or with the included player/editor software (on the original SD Card)? If not, I’d think the VLC-software is the culprit, and I would look for a solution in the software’s preference settings. • Try a different (good quality) SDHC-card (preferably one with at least 8 GB of free space). It is possible your card is simply faulty, or maybe you have so little recording space left on your current card that the card ”slows down” while saving bits of information all over the place. If all of this doesn’t help, you should contact you local Zoom distributor, who should be able to help (Mogar Music S.p.a., Via Bernini 8, 20020 Lainate – MILANO, Tel: (39) 02-935961, Fax: (39) 02-93596201, http://www.mogarmusic.it). Your recording set-up depends on how much reverb your room has and on the sound you want to achieve. The further away you are from the Q2HD – and the wider the mic angle setting is – the ”roomier” your recordings will sound. Placing the Zoom closer, and setting it to a smaller angle, will result in drier and more direct-sounding recordings. I’d start by placing the Q2HD about 2 metres away from you with the stereo width set to 90 degrees, listen back to it, and then vary according to your own taste. My pleasure – hope you get your problem solved! Hello Martin, it seems that I solved my problem, as the video and audio are OK when played on the Zoom and on the PC software, that I updated. Now, as I wish to show my guitar sound as true as possible and I am alone when recording, do you know if is it possible to monitor the video on the PC while recording? That’s because the Zoom screen is in the opposite side of the lens and I can’t control what I am recording. Using the Zoom as a webcam doesn’t seem to me the best option, or may be I am using it the wrong way? No, you cannot view the input signal on your PC during recording. The Q2HD can either record or stream the video signal, but not both at the same time. Apart from asking a friend to be your camera-operator, you will simply have to spend a little more time on short test recordings to make sure you have your picture framed correctly, before you record a real take.